Absorbency – Ability of a fabric to take in moisture. Acetate – Manufactured fiber formed from cotton linters and/or wood pulp, combined with acidic acid, extruded through a spinneret and hardened. Acrylic – Manufactured fiber, with a soft, wool-like hand that is machine washable and has excellent color retention. Antique Satin – Reversible satin-weave fabric with satin floats on the technical face and surface slubs on the technical back created by using slub-filling yarns. It is usually used with the technical back as the right side for drapery fabrics and often made of a blend of fibers. Argyle – Pattern designed with different color diamond shapes knit into a fabric. Bamboo Fabric – Bamboo fabric is a natural textile made from the pulp of bamboo grass. Bamboo fabric has been growing in popularity because it has many unique properties and is more sustainable than most textile fibers. Bamboo fabric is light and strong, has excellent wicking properties, and is (to some extent) antibacterial. Banding – Strips of fabric that can be made from coordinating or contrasting fabric. The raw edges are turned under and the fabric band is then attached as a decorative accent. Bark Cloth – Textured, woven, usually printed cotton that was popular in the 1930s, 40s and 50s as an interior fabric. The prints were often large vines, leaves and florals. Batik – Method of dyeing fabric where some areas are covered with wax, pastes or starches to make designs by keeping dyes from penetrating in pattern areas. Multicolored and blended effects are obtained by repeating the dyeing process several times, with the initial pattern of wax boiled off and another design applied before dyeing again in a new color. Batiste – A fine, often lightweight and semi-sheer fabric that is typically densely woven cotton, linen, half-linen or blended yarns. Bias Cut – Fabric cut on the diagonal direction of the fabric. Fabrics have more give on the bias than straight up and down, or across the grain. Swags hang better when cut on the bias. Bedford Cord – Cotton-like fabric with raised ridges in the lengthwise direction. Since the fabric has a high strength and a high durability, it is often used for upholstery and work clothes. Bengaline – Fabric with a crosswise rib made from textile fibers (such as rayon, nylon, cotton, or wool) often in combination. Blend – Generic term used to describe a fabric made from a combination of several natural or man-made fibers. Block Printing – Hand-printing process where the motifs are carved on wooden blocks and the dye is then applied to the fabric in a process similar to rubber stamping. Bolt – Generic term for a given amount of fabric. The width of the fabric will vary depending on the type of material, manufacturing method (see also: Railroaded) and intended use. 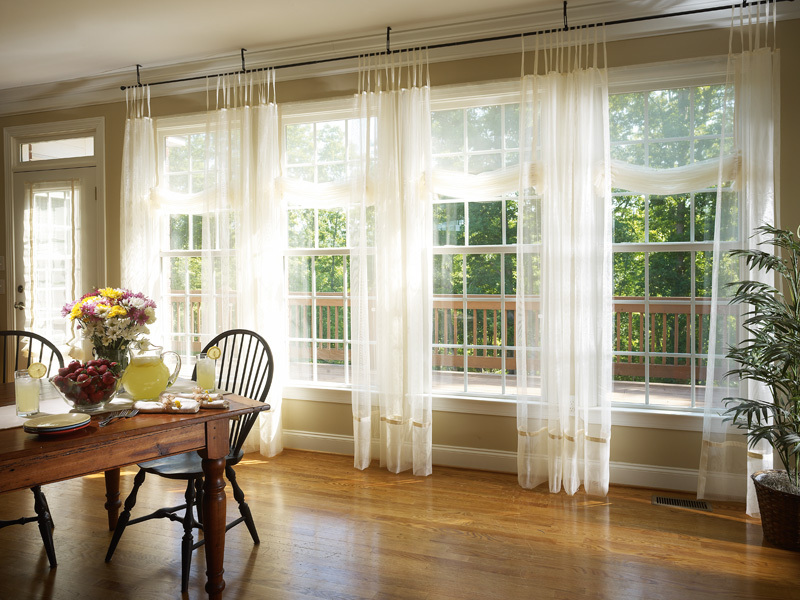 Fabric for window treatments may vary in width from as little as 40″ to upwards of 130″. The length of a bolt can also vary greatly, but for standard, stocking purposes, a typical bolt is between 40 and 60 yards. Boucle – Knit or woven fabric with small curls or loops that create a nubby surface. The fabric has a looped, knotted surface. Broadcloth – Plain, tightly woven fabric that is usually made from 100% cotton or a cotton blend. Commonly used for quilting and shirt-making. Brocade – Heavy jacquard-type fabric with an allover raised pattern or floral design. 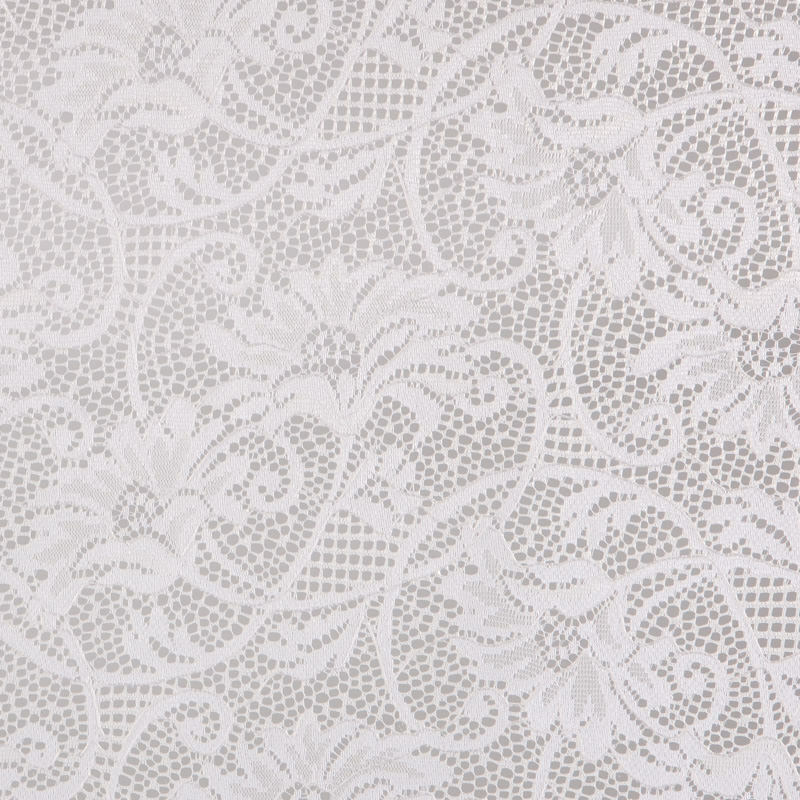 Brocatelle – Heavy fabric similar to a damask. Buckram – Stiffening material used in drapery headings to help hold the shape of the product. Burlap – Loosely constructed, heavy weight, plain weave fabric. It has a rough hand. Appropriate for draperies and decorative items. 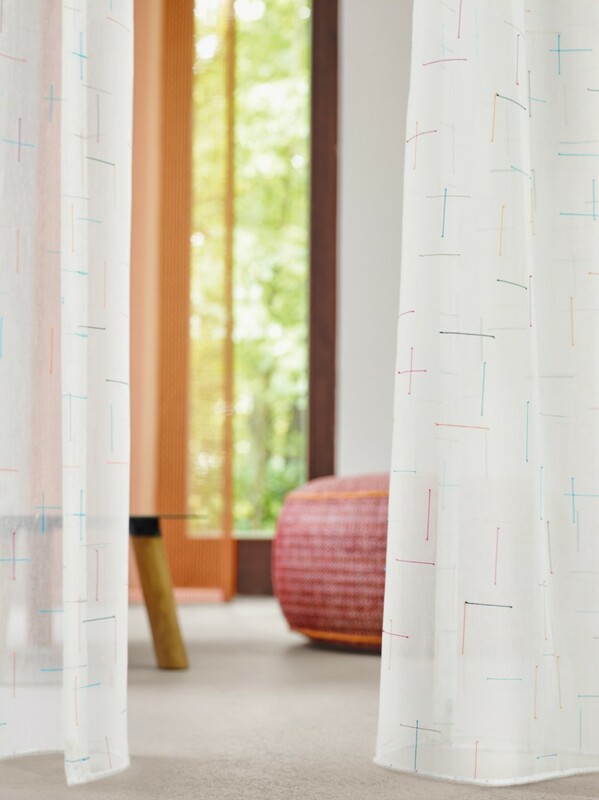 Burn Out (Devoré) – Type of pattern for curtains where the pattern is achieved using a time-consuming burn out process. This takes advantage of the different chemical behavior of various natural and synthetic fibers. Mixed fabrics/knitted fabrics made of polyester/cellulose are mainly used to produce burn out curtain fabrics. The see-through pattern, which later appears transparent, is achieved by applying corrosive liquids or protective chemicals. These burn out the cellulose content of the fabric while the chemical-resistant fibers remain unchanged. The durability and care properties of the base fabric remain fully intact during this process. This technique makes it possible to achieve attractive, large-scale break through effects that create a particularly impressive effect when used to decorate large window spaces. Calico – Tightly-woven cotton type fabric with an allover print, usually a small floral pattern on a contrasting background color. Common end-uses include dresses, aprons, and quilts. Cambric – Fine, thin white linen fabric. Canvas – Durable, tightly-woven cotton fabric. 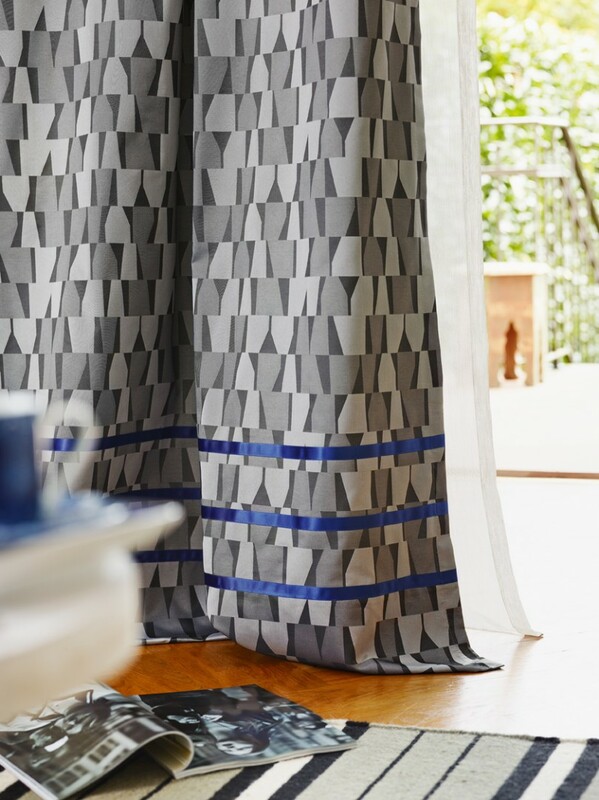 Casement – Sheer, open-weave fabric made of a variety of fibers, used for curtains and drapery backing. Challis – Soft, lightweight, plain weave fabric with a slightly brushed surface. The fabric is often printed, usually in a floral pattern. Challis is most often seen in fabrics made of cotton, wool, or rayon. Chambray – Plain woven fabric that can be made from cotton, silk, or manufactured fibers, but is most commonly cotton. It incorporates a colored warp (often blue) and white filling yarns. Chenille – Chenille is a fabric where a caterpillar-like yarn with protruding thread ends is used for the weft. In terms of look and feel, chenille is similar to velvet: It is durable, warming, usually opaque and mainly used as a decorative fabric. For floor-to-ceiling decorations, chenille is processed in such a way that the weft thread runs vertically. This influences the way the folds hang, giving it a subtle Velcro effect. Certain chenilles can help reduce energy costs and improves a room’s acoustics. Chevron – Zig-zag pattern that has become very popular in recent years from fashion to interior design. 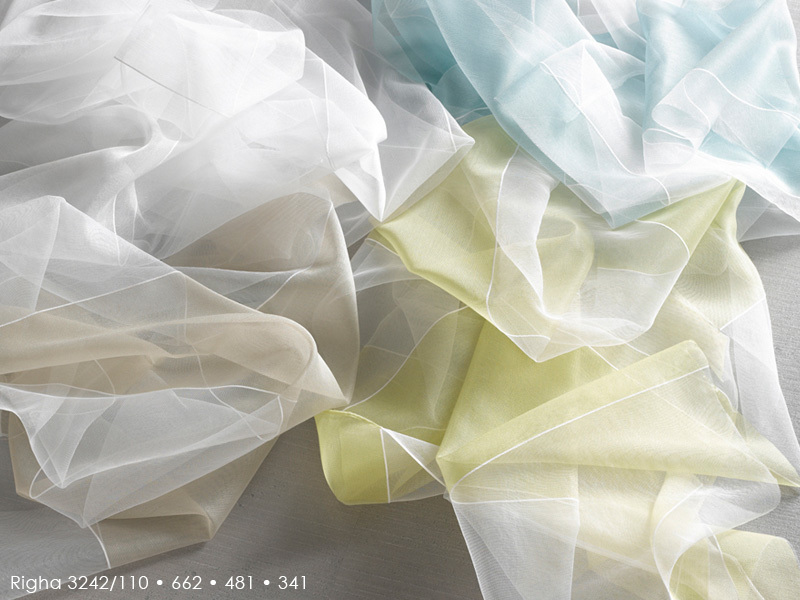 Chiffon – Lightweight, extremely sheer and airy fabric, containing highly twisted fibers. Chintz – A plain-weave fabric, which has been glazed to produce a polished look. Fabric must be dry-cleaned as the glazing will wash off with machine laundering. Suitable for drapes and lining. It is also important to avoid creases, as they will break the glaze and cannot be repaired. Chite – Painted linens that originated in Chitta (India) in the 17th century. Color Line – Full range of colors available for a particular (solid or printed) fabric. Colorway – Series of small swatches attached to a large full patterned sample which illustrate the complete color line or colorways. Cordon – ADO Cordon is a string curtain made using (machine) crocheted yarns where the individual threads hang down loosely. It can be cut to the desired measurements, and feature angled or wavy cuts. 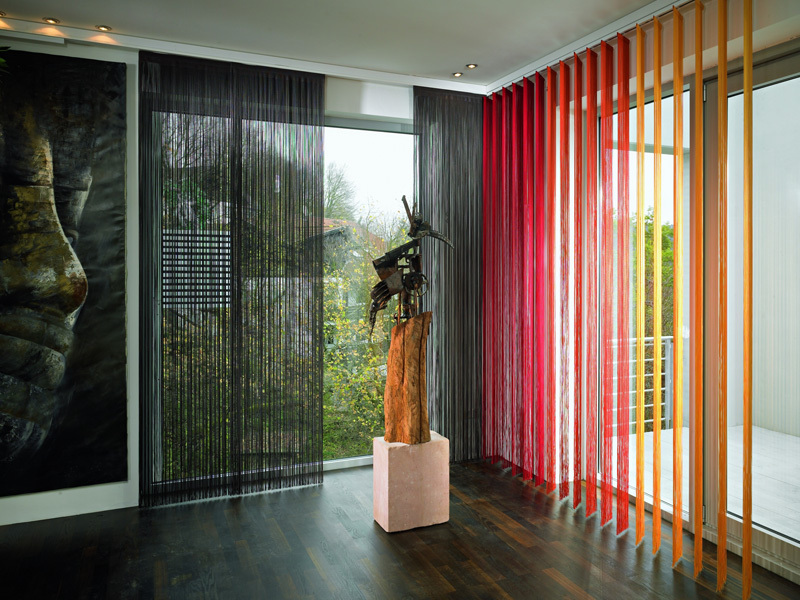 These versatile and unique panels can be used in both commercial and residential applications as a window treatment, partition or other design element. Cornelly hem – Deep hem with an embroidered pattern where the pieces are joined. Cotton – White vegetable fiber grown in warmer climates in many parts of the world, which has been used to produce many types of fabric for hundreds of years. Crash – Fully synthetic material that produces the desired crinkled effect upon shrinking/pressing and thermal fixing or chemical treatment. It is best not to use weight tape if you have a strong crash effect. These designs should never be ironed. Crepe – Used to describe all kinds of fabrics—wool, cotton, silk, rayon, synthetics and blends—that have a subtle crinkle, crimped or grained surface. Crewel – A true crewel fabric is embroidered with crewel yarn (a loosely twisted, two-ply wool) on a plain weave fabric. Traditional crewel fabrics are hand-woven and embroidered in India. The design motif for crewel work is typically outlines of flowers, vines, and leaves, in one or many colors. Modern weaving technology and inventive designers create traditional “crewel” looks with weave effects alone, without the use of embroidery. Damask – A glossy jacquard-type fabric, the patterns are flat and reversible. Unlike jacquards, the fabric is all one color. Suitable for draperies, bedding and table linens. Denim – A twill weave cotton fabric made with different colored yarns in the warp and the weft. Due to the twill construction, one color predominates on the fabric surface. Pre-wash and dry 100% cotton denim at least twice to eliminate shrinkage and color bleeding. Design – In fabric manufacturing, this refers to the work of the designer, which includes creating patterns appropriate for the material and applying them to the fabric using various production techniques. Dimensional Stability – Degree to which a fabric will retain its original shape in various atmospheric conditions. Direct Dyes – Category of dyes that are used on cellulosics and need no fixatives to secure them to the fabric. Dobby – Decorative weave, characterized by small figures—usually geometric—that are woven into the fabric structure. Dotted Swiss – Lightweight, sheer cotton or cotton blend fabric with a small dot flock-like pattern either printed on the surface of the fabric, or woven into the fabric. End-uses for this fabric include blouses, dresses, baby clothes, and curtains. Double Cloth – Two fabrics woven on the loom at the same time, one on top of the other. The two layers are held together using binder threads. The woven patterns in each layer of fabric can be similar or completely different. Double Knit – A weft knit fabric in which two layers of loops are formed that cannot be separated. A double knit machine, which has two complete sets of needles, is required for this construction. Drill – Strong, medium to heavyweight, warp-faced, twill-weave fabric. It is usually a 2/1 left-handed twill and piece dyed. Dupioni Silk – Very specific type of silk that is created with threads from two different silk worms. When two silk worms spin their cocoons close together, the fibers get tangled up; these natural fibers are then used to make the silk thread. Therefore, this type of silk thread is rougher than regular silk, and contains bumps and irregularities innate to its unique creation process. Dupioni silk can be machine washed in the gentle cycle and drip-dried. Dye Lot – Complete color run of a bolt of fabric in a specific dye batch. Dye lots may vary slightly from one batch to the next. Eyelet – Fabric with patterned cut-outs, around which, stitching or embroidery may be applied in order to prevent the fabric from raveling. Elasticity – Ability of a fiber or fabric to return to its original length, shape, or size immediately after the removal of stress. Embossing – Process in which fabrics are engraved with the use of heated rollers under pressure to produce a raised design on the fabric surface. Embroidery – One of the oldest and most sophisticated textile finishing techniques. It involves the sewing of a design on fabric using thread or cord as the embroidery material (e.g., cotton yarn, linen, silver/gold yarn, metal thread). The thread itself may also be decorated in the process or use additional decorative elements (appliqué, beading). There are a wide variety of embroidery techniques which are distinguished according to the type of embroidery stitch (e.g., cross stitch, satin stitch, chain stitch, herringbone stitch, French knot, buttonhole stitch, etc. ), the embroidery material/yarn and the base fabric used. Embroidery may be done either by hand or machine. The distinguishing feature of machine embroidery is that the stitches and motifs are entirely even. Eurohem – flair21’s signature bottom-sewn, weighted hem that provides an ideal drapery hang. Fastness – The ability of a dye to retain its color after exposure to the sun, artificial lighting, washing and/or other color-destroying agents. Related terms include colorfast, sunfast and lightfast. Faux Linen – Fabric manufactured to resemble linen that can contain a variety of man-made or natural fibers, but little to no natural linen. Faux Silk – Fabric manufactured to resemble silk that can contain a variety of man-made or natural fibers, but little to no natural silk. Fibers – The raw material used to make textiles. The two major categories are natural and synthetic. Finishing – Various processes used at the end of textile manufacturing where special substances (e.g. flame retardancy, anti-microbial, etc.) are added to increase the functional value of the textile. Flax – Plant from which cellulosic linen fiber is obtained. Linen is used in apparel, accessories, draperies, upholstery, tablecloths, and towels. Foil – Thin piece of material put under another material to add color or brilliance. Gabardine – Twill weave that is wrinkle resistant. Wool gabardine is the most common and is considered year-round fabric for suits. Gauze – Sheer, open-weave fabric usually made from cotton or silk. It is suitable for blouses, dresses and curtains. Georgette – Semi-sheer woven drapery fabric created from highly twisted yarns creating a pebbly texture. Gingham – Medium weight, plain weave fabric with a plaid or check pattern. End-uses include dresses, shirts, and curtains. Gossamer – Very soft, gauze-like veiling originally of silk. Grois Point – Fabric featuring large points of yarn on the surface of the fabric. Grosgrain – Firm, tightly woven, warp-faced fabric with heavy, round filling ribs created by a high-warp count and coarse filling yarns. 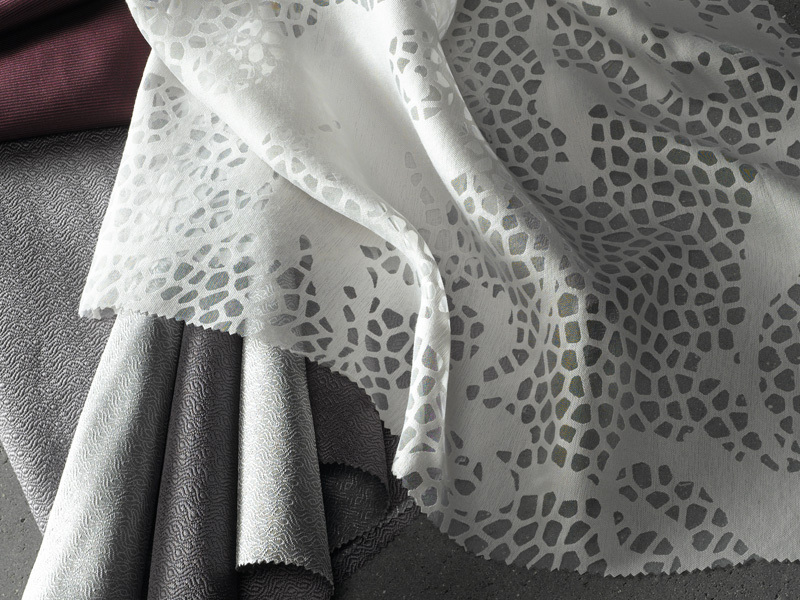 Habutai – Soft, lightweight silk fabric that is heavier than Chinese silk. Heather – Yarn that is spun using pre-dyed fibers. These fibers are blended together to give a particular look. (For example, black and white may be blended together to create a grey heathered yarn.) The term, heather, may also be used to describe the fabric made from heathered yarns. Herringbone – Variation on the twill weave construction in which the twill is reversed or broken at regular intervals, producing a zig-zag effect. Homespun – Refers to a coarse, plain weave fabric with a hand-woven look. Horizontal Trim or Band – Trim applied in a side-to-side fashion. Houndstooth Check – Variation on the twill weave construction in which a broken check effect is produced by a variation in the pattern of interlacing yarns, utilizing at least two different colored yarns. Ikat – A fabric, usually handwoven which has been tie-dyed in the yarns prior to weaving. The pattern can range from simple little dots to intricate double ikats. Imberline – Stripe effect that is produced by using a variety of colors in the warp. Inherently Flame Retardant – Fabrics woven with special fibers that are permanently flame retardant. Interlining – Insulation, padding, or stiffening fabric, either sewn to the wrong side of the lining or the inner side of the outer shell fabric. Jacquard – Woven fabrics manufactured by using the Jacquard attachment (invented by Joseph Marie Jacquard in 1805) on the loom. This attachment provides versatility in designs and permits individual control of each of the warp yarns. Thus, fabrics of almost any type or complexity can be made with large, highly-detailed patterns. Brocade and damask are types of jacquard woven fabrics. Khaki – Tan or dusty colored warp face twill, softer and finer than drill. Name derived from East India word meaning “earth color.” Fabric made of cotton, linen, wool, worsted, or manmade fibers and blends. Knit Fabrics – Fabrics made from only one set of yarns, all running in the same direction. Some knits have their yarns running along the length of the fabric, while others have their yarns running across the width of the fabric. Knit fabrics are held together by looping the yarns around each other. Knitting creates ridges in the resulting fabric. Wales are the ridges that run lengthwise in the fabric; courses run crosswise. La Coste – Double-knit fabric made with a combination of knit and tuck stitches to create a mesh-like appearance. It is often a cotton or cotton/polyester blend. Lace – Open fabric with yarns that are twisted around each other to form complex patterns or figures. Lace may be hand or machine made by a variety of fabrication methods including weaving, knitting, crocheting, and knotting. Lamé – Fabric woven using flat silver or gold metal threads to create either the design or the background in the fabric. Linen – Natural plant fiber, linen fibers are stronger and more lustrous than cotton. 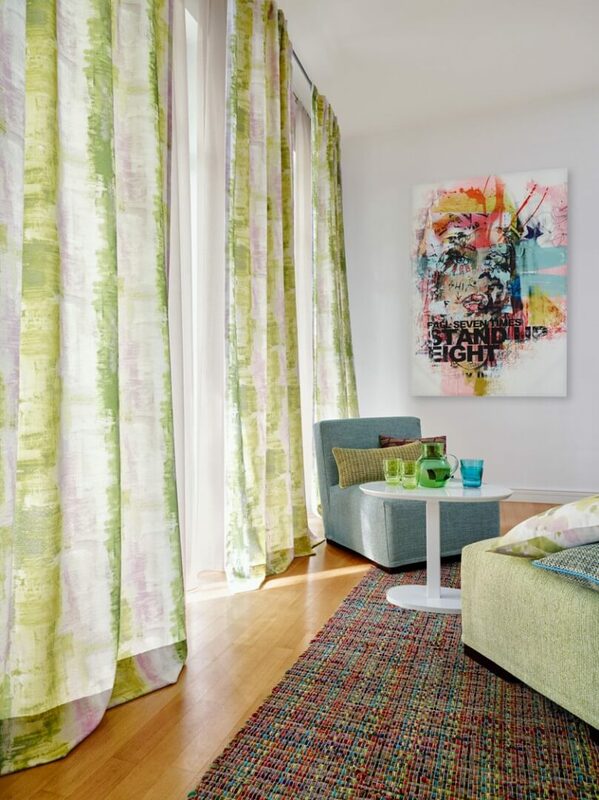 A popular and trendy choice for curtains. Lining – Generic term for fabrics used to cover inner surfaces, especially when the inner face is a different material than the outer surface. Lawn – Light, fine cloth made using carded or combed, linen or cotton yarns. The fabric has a crease-resistant, crisp finish. Linen lawn is synonymous with handkerchief linen. Cotton lawn is a similar type of fabric, which can be white, solid colored, or printed. Leno – A weave used in high quality casements; the warp yarns are twisted around the filling yarn in figure-eight pattern. Marquisette – Lightweight, open fabric made from combed cotton, silk or man-made fibers. Matelassé – Medium to heavyweight luxury fabric made in a double cloth construction to create a blistered or quilted surface. Common end-uses are upholstery and drapery. Matte – Flat, non-reflective fabric surface. Mercerized – High-quality finishing process to cotton yarn where the application of caustic soda and tension develop a smooth lustrous surface. Merino – Type of wool that originates from pure-bred Merino sheep. The best Merino wool comes from Italy. Mesh – Type of fabric characterized by its net-like open appearance and space between the yarns. Mesh is available in a variety of constructions including wovens, knits, laces, or crocheted fabrics. Microfibers – Extremely fine synthetic fiber that can be woven into textiles with the texture and drape of natural-fiber cloth but with enhanced washability, breathability, and water repellency. Moiré – Corded fabric, usually made from silk or synthetic fiber, which has a distinctive water-marked wavy pattern on the face of the fabric. Monk’s Cloth – Heavy weight cotton fabric utilizing the basket weave variation of the plain weave. Used for draperies and slip covers, monk’s cloth is an example of 4 x 4 basket weave. It has poor dimensional stability and tends to snag. Muslin – Inexpensive, medium weight, plain weave, low count (less than 160 threads per square inch) cotton sheeting fabric. Natural Fiber – Textile fiber manufactured from an animal or vegetable source. Cotton, linen, silk and wool are the most prevalent examples. Net – Refers to any open-construction fabric whether it is created by weaving, knitting, knotting, or another method. Nub Yarn – Novelty yarn containing intentional slubs or lumps. Also referred to as seed yarn. Ombre – Fabric featuring a shaded effect that is achieved by laying closely colored hues of yarn across weft. 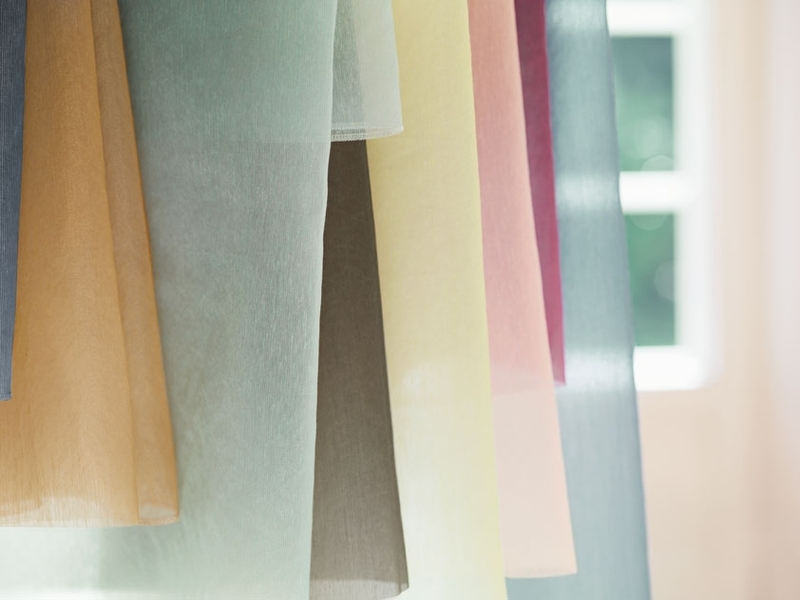 Organdy – Stiffened, sheer, lightweight plain weave fabric, usually cotton or polyester. Organza – Crisp, sheer, lightweight, plain-weave fabric, with a medium to high yarn count, made of silk, rayon, nylon, or polyester. Also referred to as monofilament. Organzine – Typically used for the warp in fine taffeta and damasks, this high quality yarn is twisted from many strands of raw silk, making it costly to produce. Overdrapery – Generic term for fabrics of a heavier weight (than sheers) and are intended for use as draperies. Oxford – Fine, soft, lightweight woven cotton or blended with manufactured fibers in a 2 x 1 basket weave variation of the plain weave construction. The fabric is used primarily in shirtings. Paisley – Abstract, decorative pattern. It resembles a large comma in its most basic form. Paisley takes its name from the Scottish town near Glasgow from which the pattern came. It was an important center for textile processing in the 19th century. The origin of the pattern goes back to a floral design from the Himalayan principality of Kashmir. It went from there to India. English soldiers brought woven scarves featuring the pattern back to the UK, where it was imitated as a woven and print design in Paisley. Passementerie – Collective term for decorative textile articles such as laces, fringes, netting, braids, trimmings and tassels. Passementerie can be used as decorative stylistic devices in different colors, materials and finishes, and are also useful, for example, for gathering fabrics. Pattern – Variety of decorative designs on textiles. Pima Cotton – Type of cotton plant developed in the Southwestern USA from a cross between Egyptian and Uplands cotton which is longer in fiber length and more lustrous than most American cottons. It is used to weave some of the popular quilting fabrics which have a silk-like hand. Piece Dyed – Fabric that is dyed in a vat by the bolt (full piece) after weaving. Pigment Printing – Type of direct printing. Color or metal pigments are applied directly onto the fabric and fixed. Pilling – Abrasion that causes the filament to break away from the yarn in a fabric. Piqué – A medium-weight cotton or cotton blend fabric with a pebbly weave that looks almost like a check. Plain Weave – The most basic method of interlocking warp and weft threads to form fabric. Each filling thread alternates passes over and under the warp yarn for a strong, balanced construction. See also: Tabby. Pleats – A technique to create volume by folding the fabric and tacking it to hold the shape. There are many different types of pleats including Pinch Pleat, Bohemian and Goblet. Plissé – Lightweight, plain weave, fabric, made from cotton, rayon, or acetate, and characterized by a puckered, striped effect, usually in the warp direction. The crinkled effect is created through the application of a caustic soda solution, which shrinks the fabric in the areas of the fabric where it is applied. Plissé is similar in appearance to seersucker. Plush – Compactly woven fabric with warp pile higher than that of velvet. Made of cotton, wool, silk, or manmade fiber, often woven as double face fabric and then sheared apart. Higher pile gives bristly texture. Usually piece-dyed but may be printed. Used for coats, upholstery. Pinstripe – Very narrowly-striped fabric. Especially popular in formal suits. Pointelle – Feminine, delicate-looking, rib-knit fabric made with a pattern of openings. Polyester – Synthetic fiber introduced in the early 1950s. It is second only to cotton in worldwide use. Polyester has a high level of strength (although somewhat lower than nylon), light fastness and abrasion resistance. Low absorbency allows it to dry quickly. Railroaded – When fabric is railroaded, the width of the fabric becomes the length. Most flair21 fabrics are railroaded, allowing for seamless draperies and other window treatments—of any width—up to 128″ tall. Ramie – Bast fiber, similar to flax, taken from the stalk of a plant grown in China. Raschel Knit – Warp knitted fabric in which the resulting knit fabric resembles hand crocheted fabrics, lace fabrics, and nettings. Raschel warp knits contain inlaid connecting yarns in addition to columns of knit stitches. Rayon – Natural fiber created from wood pulp, it usually has good drape and a soft hand. Rep – Plain weave fabric produced by weaving large filling yarns through fine warp threads which result in distinct ribs running from selvage to selvage. Repeat – Distance between the beginning of one complete pattern and the beginning of the next identical pattern. Fabrics may have a vertical repeat, horizontal repeat or both. Rib Knit – This knit has tremendous stretch across the grain a 1 x 1 rib has one rib up and one down. A 2 x 1 rib has two ribs up and one down. Sailcloth – Heavy, plain-weave canvas fabric, usually made of cotton, linen, polyester, jute, nylon, etc..
Sateen – Fabric made from yarns with low luster, such as cotton or other staple length fibers. The fabric has a soft, smooth hand and a gentle, subtle luster. Sateen fabrics are often used for draperies and upholstery. Satin – With a lustrous, shiny surface, drapeability depends on fiber content. Silk and rayon satins have the best stitch results. Scherli – Usually a light ground fabric such as voile. Additional effect threads are woven in according to a pattern. Fibers that are not interwoven hang loosely on the rear side of the fabric and are sheered off after weaving. Seeded – Typically voile or batiste fabric that is manufactured with seed or nub yarn to create a slub effect. Selvage – Fabric edge that is woven to prevent fraying. Sheer – Any transparent or very lightweight fabric (e.g., chiffon, georgette, voile, etc). Silk – Natural filament fiber produced by the silkworm in the construction of its cocoon. Most silk is collected from cultivated worms; Tussah silk, or wild silk, is a thicker, shorter fiber produced by worms in their natural habitat. All silk comes from Asia, primarily China. Slub – Think, unevenly twisted place in yarn that may be either a flaw or intentional construction. Soft Fold – Fabrics that will leave a permanent crease when doubled. Straight Cut – Fabric cut in the direction in which it comes of the roll. Strie – Very fine, irregular streaked effect made by a slight variance in the color of warp yarns. Tabby – Plain weave construction in which one warp thread passes over and under a single weft thread. The threads of the warp and weft are of the same size and set with the same number per square inch thereby resulting in a balanced weave. Tapestry – Heavy, often hand-woven, ribbed fabric, featuring an elaborate design depicting a historical or current pictorial display. The weft-faced fabric design is made by using colored filling yarns, only in areas where needed, that are worked back and forth over spun warp yarns, which are visible on the back. End-uses include wall hangings and upholstery. Textured – Fabric pattern, weave or other manufacturing process resulting in a raised surface. 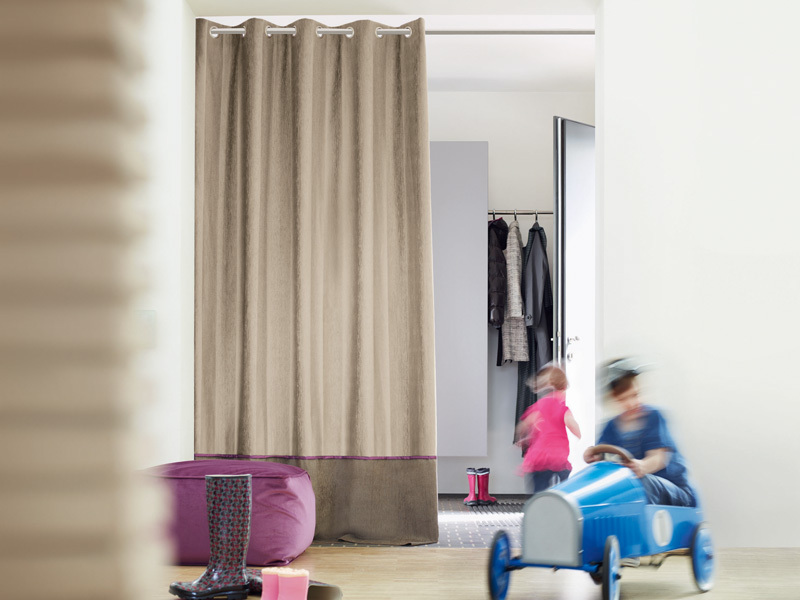 Thermo Chenille – Decorative fabrics made from thermal chenille function as heat insulators in front of windows and ensure the textile insulation of a room. It is an attractive and effective energy saver that can be added at any time. Thermo Chenille fabric is also sound absorbing, which is particularly effective in rooms with high ceilings or hard floors such as tile, wood or laminate. Ticking – Variety of fabrics are known as “ticking.” The main weave is a closely-woven, thick yarn twill. Spaced, colored, and natural or white yarns repeated in the warp, and all natural or white in the filling, forming a stripe. Several color combinations used, as blue and white, brown and white, red and white. Heavy warp-face sateens as well as heavy sheetings are printed and sold as ticking. Jacquard damask ticking woven in damask effects also sold for this purpose as well as other fabrics, such as drills. Toile – Type of decorating pattern consisting of a white or off-white background on which a repeated pattern depicting a fairly complex scene, generally of a pastoral theme such as (for example) a couple having a picnic by a lake. The pattern portion consists of a single color, most often black, dark red, or blue. Greens and magenta toile patterns are less common but not unheard of. Tweed – Medium to heavy weight, fluffy, woolen, twill weave fabric containing colored slubbed yarns. Twill – Fabric that shows a distinct diagonal wale on the face (e.g., denim, gabardine, tricotine). Velvet – With a longer pile, velvet is the most luxurious fabric. Stretch velvet has some lycra, It can be machine washed and will not create a shine. Velveteen – Cotton or cotton blend fabric with a short, dense pile. It lacks the sheen and drape of velvet. It is perfect for drapes and home décor items. Viscose – Most common type of rayon. It is produced in much greater quantity than cuprammonium rayon, the other commercial type. Voile – French for ‘veil’. 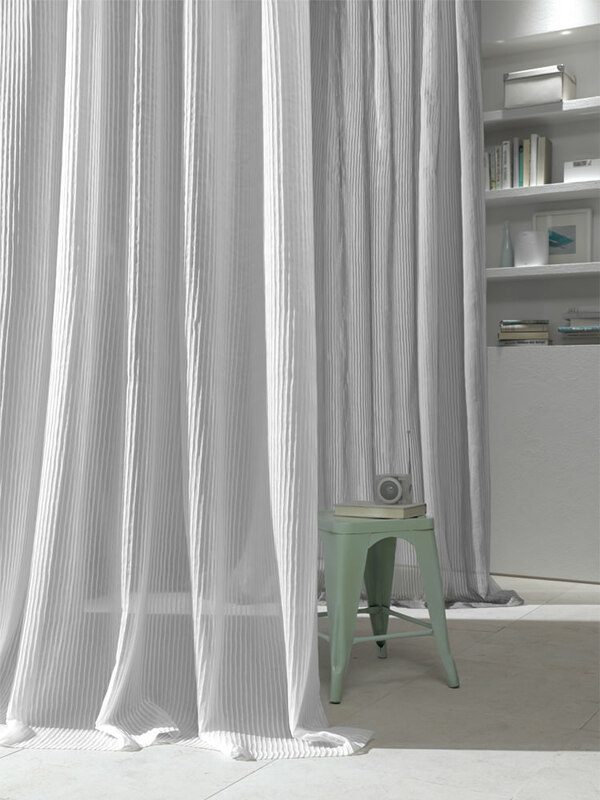 Voile is a lightweight, plain-weave, cotton-like fabric made of very highly twisted yarns that is used for curtains. Waffle Cloth – Similar to piqué in texture. Waffle cloth has a honeycomb weave made on dobby loom. Usually of cotton. Warp – Threads of a textile that run vertically through the loom and are parallel to the selvage. Weft – Horizontal yarns in a cloth which run selvage to selvage across the fabric. Welt – A twisted, cotton cord, covered with fabric and applied to the treatment. Width – A single cut of fabric. This term is usually used in connection with 54” or other non-railroaded fabrics. The term ‘width’ is also used when referring to the ‘rod width’ or ‘finished width’ for finished window treatments. Weight tape – Ribbon-like weight consisting of small lead balls that is inserted at the lower hem of the curtain or decorative fabric in order to ensure the window decoration hangs evenly. See also Eurohem. Wool – Naturally stain and wrinkle resistant. It can absorb up to 40% of it’s weight in moisture without feeling damp. Wool comes in many forms including crepe, challis, gabardine, merino, melton, jersey and worsted wool suitings. Woven Fabric – Fabrics composed of two sets of yarns. One set of yarns, the warp, runs along the length of the fabric. The other set of yarns, the fill or weft, is perpendicular to the warp. Woven fabrics are held together by weaving the warp and the fill yarns over and under each other. Yarn – Continuous strand of textile fibers created when a cluster of individual fibers are twisted together. These long yarns are used to create fabrics, either by knitting or weaving. Yarn Dyed – Fabric that is woven with yarns that have been dyed prior to weaving. Most high-quality fabrics are yarn dyed. Thank you! I have worked with fabrics and draperies for many year, but truly appreciate having a concise description list. Thank you, Barbara. We’re glad this is a useful resource for you. Is there any other content you would like to see/have all in one place?